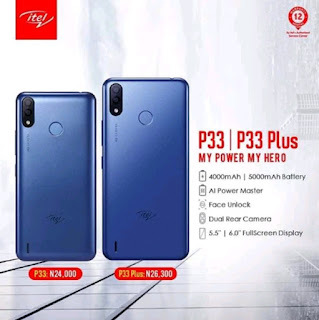 ITEL Mobile has quietly launched two smartphones which are ITEL P33 and P33 Plus. The two Android smartphones almost featured the same specs, but there's a small difference between the phone Storage, RAM, and the Battery capacity. In terms of ITEL P33 Specs, The Smartphone is a dual sim (Nano) and it runs on Android 8.1 (Go Edition) with 6.0-inch IPS LCD capacitive touchscreen 720 x 1440 pixels. The phone comes with 16GB of inbuilt storage and 1GB of RAM and also with 4000mah of the inbuilt battery. In terms of photography, The new ITEL P33 Spot 8 + 5 Megapixels at the rear while there are 5 Megapixels at the from with LED Flash. The ITEL P33 connectivity includes 2G, 3G, Wi-Fi, Bluetooth, FM Radio, GPS, and more. 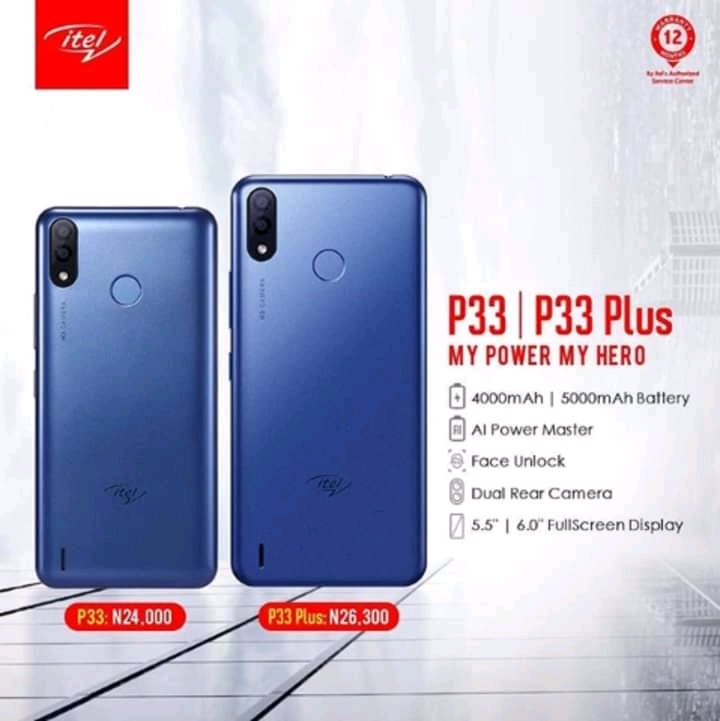 In terms of ITEL P33 Plus Specs, The Smartphone is a dual sim (Nano) as well and it runs on Android 8.1 (Go Edition) with 6.0-inch IPS LCD capacitive touchscreen 720 x 1440 pixels. The phone comes with 16GB of inbuilt storage and 2GB of RAM and also with 5000mah of the inbuilt battery. In terms of photography, The new ITEL P33 Plus Spot 8 + 5 Megapixels at the rear while there are 8 Megapixels at the front with LED Flash. The ITEL P33 connectivity includes 2G, 3G, Wi-Fi, Bluetooth, FM Radio, GPS, and more.